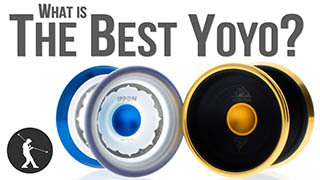 Find out what are the best yoyos for 2015. Recommended Budget Metal Yoyos: Shutter Yoyo, Minute Yoyo, Horizon Yoyo. Recommended High-End Metal Yoyos: Gradient Yoyo, Civility Yoyo. 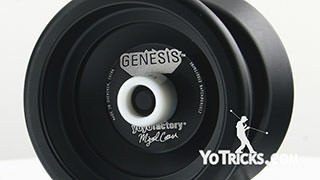 This is the 2015 edition of the Yoyo Buyer’s Guide for YoYoTricks.com. If there’s a newer buyer’s guide and you are on Youtube, you can just click a link right here and that will take you to that guide. 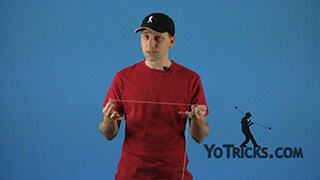 On YoYoTricks.com you can just look right below the video and we will have a link for that guide if it’s available. 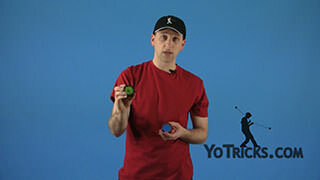 On the YoYoTricks.com app for Apple or Android devices we’ll have a link right below those videos as well. Throughout the video we will put links in the same places anytime we refer to a product. In this video we just to do one thing and that’s answer the question, what is the best yoyo? We know when we ask questions like what is the best, it is really just a matter of opinion. So these are our opinions of what are the best yoyos we can make available to you right now. When it comes to answering this question, a big part of the answer is actually you. How good you already are as a player, how much you want to spend, and also what yoyos you already have. 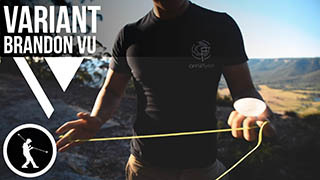 Because if you are a brand new player getting a yoyo that is really advanced might actually make learning tricks a lot more difficult or even frustrating. If you’ve only got twenty-five dollars to spend, then there really isn’t any point to looking at 100 dollar yoyos, so we’ll recommend something else. If you’ve already got a yoyo, what we recommend is actually getting a different yoyo with very different qualities that the one you already have. While it’s true that if you are just trying to learn one specific trick it’s not going to be really all that helpful to get a whole new yoyo for just that one trick, if you get yoyos with diverse qualities, each yoyo is going to make learning certain tricks easier and certain tricks more difficult and having those different yoyos will encourage you to push into different spaces with your tricks and skills and will help you become a better and more well rounded player. Now the other thing I want to do before I go on to actually addressing which yoyos are the best is if you are new to yoyoing there’s some unexpected things that you may not know that you should consider when you are getting your first yoyo. So I want to address those first. The first one is that most yoyo these days actually come with ball bearings and because of that if you use your yoyo a lot, the bearing could actually wear out if it is not properly lubricated. So we sell yoyo specific lube, it comes in thick and thin, and we actually have videos that describe the different qualities. It is a good idea to pick some of that up if you don’t have some already. The other thing is of course yoyos have strings and you can imagine strings are going to wear out and they’ll break over time. So again it’s a good idea to pick up some extra string. A lot of yoyos they also have these little round silicone o-rings on the inside that help them come back and after about four to six weeks of really intense play, those can wear out and they will need to be replaced. So again you might want to look for those. 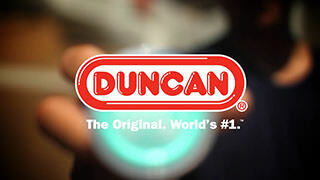 Now to make it easier to figure out which lube and strings and response pads to get , on every yoyo on our store, we have a little recommended section you can find and it will tell you the right type of lube for that yoyo, the right type of string and also the right type of response pads and you can just click on those and it will take you to the right place that’s on the store to pick up those items. In addition, just about every yoyo that we sell comes in either a kit or a pack that includes a lot of the items that you are going to need, especially if your a first time buyer so it’s a good idea to check those out. This buyer’s guide is going to be just a little bit different than what we’ve done in the past. In the past we’ve recommended just our top yoyo for every different category that we made suggestions and in this one we are going to do the same thing but in some of the categories we are going to offer some additional yoyos. What these are for is if you’ve already got the yoyo we recommended but you’re looking to get a couple other yoyos or just one other yoyo, then the recommendations we are going to give are the ones that will be the most complimentary, that will give you the most diverse set of yoyos and play styles so that you can become the best player possible. So lets get to it. The first yoyo is for what we call the absolute beginner, and this is somebody who has never ever yoyoed before or maybe they got a yoyo and threw it down and that was pretty much it, they never got it back up. If you’ve already thrown a yoyo even a little bit before, if you’ve thrown it down and got it back up, we would actually promote you from beginner to what we call a starter. But if you’re a real absolute beginner the yoyo we recommend the most is still the F.A.S.T. 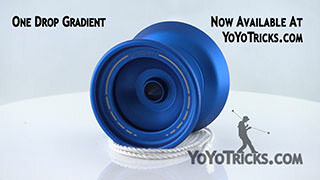 201, and we’ve recommended this yoyo before and so far nothing has really come out on the market that replaced this for us. It’s still just seems to be the best option and let me show you why. When you take this yoyo apart, it’s got these little teeth on the inside that you can actually kind of push into the yoyo. What those are for is they help the yoyo come back especially easily and if you are trying to wind the string by hand that’s even easier which is unusual on a ball bearing yoyo. What’s nice about it is, not only only does it make the yoyo a lot easier to use, but it doesn’t hold you back as much as a lot of beginner yoyos do. So we feel like this is just a really good option for getting you started it will get you through those first couple of tricks that can be really difficult and then you’ll be ready to move on to all the more advanced tricks once you’re ready. 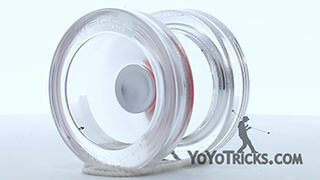 So like I said if you are beyond the beginner stage but you still feel like you don’t know a lot of tricks, you are going to be in what we call our starter category, and so our number one recommended starter yoyo is the Sage. 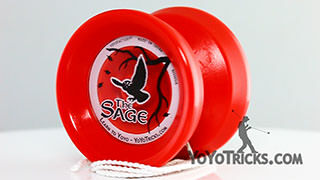 The reason why we like the Sage is because it’s a nice wide yoyo, which will introduce you to your different string tricks. But it also comes playing very easily, and so when you throw it down you just give it a tiny bit of a tug and it comes right back. It also sleeps a long time for a starter yoyo which will make it a little bit easier for you to get into those first tricks. Even more important than that, it’s actually upgradeable. What that means is you can actually take the bearing out of this one and replace it and it will turn your yoyo into a more advanced or what’s called an unresponsive yoyo. So I set up a Sage like that, this one right here, and I’ll show you what that means. As you know a normal yoyo, you throw it down and pull it up and it comes back, while an unresponsive yoyo is designed to not come back when you pull it back up. What this does for you is it opens the possibility of doing very different and really impressive tricks that just can’t be done on a regular yoyo. So it’s really nice when you have a starter yoyo to get one that is upgradeable because then it will be able to take you to that next level. So the Sage is just in so many different ways it’s really just the best option. Now if you are just getting into learning tricks what we would recommend is getting is what we call the Sage Yoyo Starter Pack. And the starter pack it comes with the yoyo and it comes with thick lube which will keep it playing really easy and really responsive. If you feel like you are getting ready to get into unresponsive yoyoing, if you started doing tricks where you land the yoyo onto the string or if you know how to bind, then we would recommend kind of bypassing the Starter Pack and getting what we call the Sage Pro Pack. That comes with the Sage and the replacement bearing that upgrades it to an unresponsive yoyo, that also comes with thin lube to protect that bearing. Now if you kind of want the best of both, what a lot of people have been doing is they’ve been getting the Pro Pack and then also been getting Thick Yoyo Lube in addition to that. The Thick Lube helps the yoyo as you first get it play a little bit easier and then when you upgrade the bearing the Pro Pack comes with everything else that you need. So that’s another good option. Now if you already got a Sage, or if you are looking for something a little bit different in this category, what we recommend for you is the DV888. 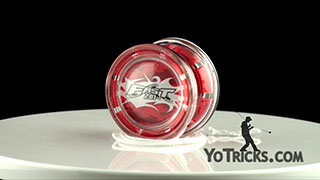 This is a metal yoyo so if you are thinking about getting a metal yoyo but you are a new player this is a good option. 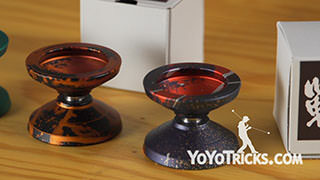 As you can see the DV888 is a pretty different yoyo compared to the Sage. The Sage is a little bit bigger and the shape of the DV888 is actually little bit more comfortable to hold, especially if your hands are small. But like the Sage it has a lot of the those good starter yoyo characteristics. It sleeps really easily but if you just give it just a little bit of a tug it comes right back which is great. It sleeps long enough for you to start learning all of your tricks and it is also upgradeable, and so we actually sell a DV888 unresponsive kit. It gives you all the little different pieces and the bearing that you need to turn it into a full unresponsive yoyo so that you can continue on your way into becoming a better player. So once you got into unresponsive yoyoing, eventually you are going to want to push forward and get a yoyo that really isn’t going to hold you back. 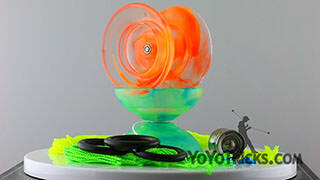 So if you got a budget of over fifty dollars the yoyo we recommend most is the Shutter. 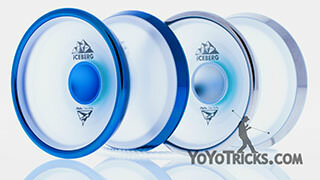 We have been recommending this yoyo for a long time and for good reason. In fact, in 2014 this was the yoyo that was used to win the World Yoyo Contest. 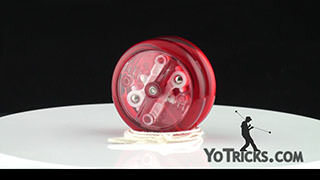 So you can see this yoyo really allows you to break through and it’s not going to hold you back. 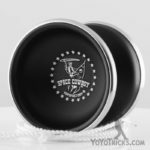 But there is other reasons we recommend it as well, especially if it’s your first yoyo in this price point, and your first yoyo that you are using to get into those types of tricks. The first thing is the Shutter is a very standard shape in terms of dimensions is what I mean. So it’s got pretty much the normal diameter that a lot of yoyos have and a pretty normal width and what that means is that it is going to be good for a broad range of tricks. But there is one distinctive feature of the Shutter is that it’s very good at staying on plane, it resists moving side to side while you are doing tricks. Which means that while you are doing all your different string tricks it’s going to make those a little bit easier, if you are doing tricks that are kind of moving away from your body it’s going to stay on plane to make those tricks easier. If you want to start learning your different body tricks, again that particular quality is just going to be something you are really going to appreciate about the Shutter. So for all these different reasons we just, we still feel like this is just the best option when you are getting into this level of play so we highly recommend this yoyo. Now if you already got a Shutter or you tried that and are looking for something different we do have a couple of other yoyos that we want to recommend that are a good complements to the Shutter, and the first one is the Minute. The first thing you will notice when you compare the Minute to the Shutter is that the Minute has a smaller diameter. Like most yoyos with a smaller diameter it’s going to play a little bit faster than most yoyos but also what they’ve done with this is they concentrated a lot of weight around the outer edge of the yoyo, and what that does is it gives you a greater sense of control. So with a lot of fast yoyos that can feel a little bit wild, especially if you are not used to that speed but that control makes you feel like even though it is going faster you can actually manipulate the yoyo and get it do what you want which is really great. Now the other thing about the Minute is because it’s got that smaller diameter it is going to be a little better when you are hitting your chopstick tricks and especially when your hands are a little bit smaller its going to give you a bit of room to do that. 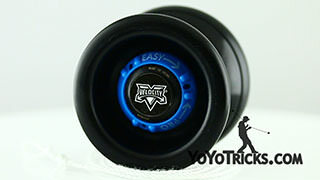 When you are doing your grinds, that smaller diameter is actually going to give you a lot more time to hit your tricks. Which is just is going to be an advantage that you just won’t have with larger yoyos, and so we are really excited to recommend the Minute to you and I think that you are really really going to enjoy this yoyo. 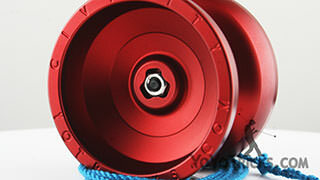 Now on the other side, again comparing it to the Shutter, the other yoyo we want to recommend to you is the Horizon. Comparing it to the Shutter the first thing you will notice about the Horizon is that it has a considerably larger diameter, which does give it a whole unique set of qualities, but the most distinctive feature about this yoyo is this bowl shape on the inner cup, which is actually great for doing off-axis finger grinds. Compared to any other yoyo that we’ve ever carried, the Horizon is able to do finger spins much longer which opens up for a whole different set of tricks. That larger diameter actually gives it a lot of power when it’s spinning so that you can not only extend the length of your finger spins but actually every single trick this yoyo will sleep a little bit longer it resists leaning a little bit more because of that. 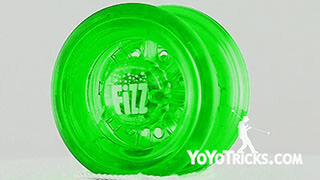 So if you are looking for a yoyo to really help you power through tricks and if you are at all interested in finger spin tricks the Horizon is the yoyo for you. Now the Horizon, the Minute, and the Shutter, those in our store are all in what we call the budget metal category. Those are just metal yoyos that are under sixty dollars. This is kind of a dynamic category for us, throughout the year you may notice yoyos coming in and out of this category as we try new yoyos and as we find things that kind of fit into this mold of just yoyos that are going to really help a player become a more dynamic yoyoer. So it’s a good idea to just check back there every now and then to just see what we have in stock and read our descriptions to see what those yoyos can do and why we decided to add them to our store. But if price is really not a concern for you, then it actually opens up two more areas of our store and that is the high end metal yoyos and also the bi-metal yoyos. One thing I do want to point out is that when you go from a budget metal to a high-end or a bi-metal, because the yoyos are more expensive you may think, wow, these are going to have a huge bump in performance, and actually that is not really the case. All these metal yoyos are really machined using the same processes and a lot of them have the same bearing. So you are not going to see that huge jump that you might expect, and so you may wonder, well why would I even bother spending more money on a yoyo? But there is actually a lot of good reasons. So if you start to look at the high-end metal yoyos what you will find is a lot of them are made in the United States or Canada which is really nice. A lot of them have some very distinctive features that you just won’t find in the budget metal category, and a lot of these yoyos are more limited runs and that’s part of what also makes them more interesting but can make them cost a little bit more money. So one of the yoyos we have been carrying that we really like and it seems like our customers really appreciated is the Gradient. 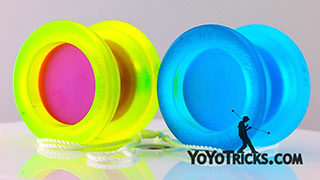 The Gradient is made by One Drop which is an American company and we really really respect the quality of their work and it also comes with side effects which are these little pieces that you can take out or put back in the yoyo which can change the weight distribution of the yoyo. 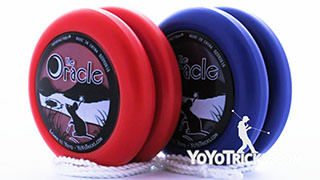 So your yoyo can play just a little bit different day to day which is a really neat feature, and we have a whole review on this yoyo and we definitely think you should check that out because we really enjoy this yoyo and that will tell you everything you need to know about it to see if its the right yoyo for you. 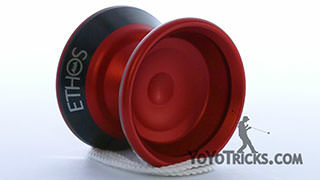 Now the other high-end metal yoyo that we definitely want to talk about is our own Civility yoyo. 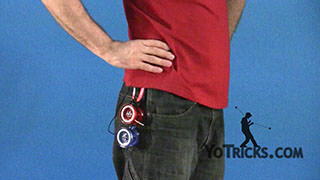 This is the yoyo we use in all of our videos to teach the most advanced tricks. One thing that we haven’t talked about so much before is the stainless steel nut capture system that we use in this yoyo. Beside just being a nice design element, one of the things that makes this great is because the nut is stainless steel, stripping on this yoyo has been a non-issue. The other thing that is kind of nice and you wouldn’t really notice this until you really started learning tricks, is that the Civility yoyo is really easy to take apart and to put back together. Compared to a lot of yoyos, some yoyos the bearings they fit really really tight on the yoyo and so you will have to really work hard to get the yoyo halves apart and then once you’ve got them apart and then once you got that knot out, you actually have to kind of balance the top half on the yoyo and hope that the threads connect the right way and if you accidentally have it lean in little bit when you are getting the yoyo together, those threads can cross thread and that can strip your yoyo and that can have a devastating effect on the yoyo. So that’s just something you won’t have to worry about if you get a Civility, and because the Civility is the yoyo we use when we teach the most advanced tricks on our site, you can be confident that it will be able to do all the tricks you want to learn on our site. So the next category is bi-metal yoyos. 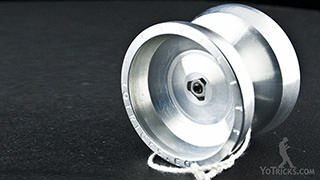 These are yoyos that are composed of two different metals, usually aluminum and stainless steel, or titanium or brass. These yoyos have become really popular lately and I think its because you can achieve something with bi-metal that you just can’t with a solid aluminum yoyo. The reason for that is that these different metals that they are putting onto the yoyo, they weigh more than straight aluminum and so you can put weight and center it in just one place in a way that you just can’t otherwise. 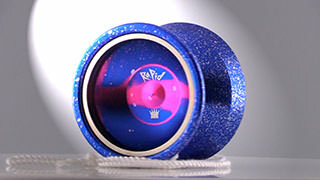 This is one of those things that companies are going to add bi-metal yoyos sometimes very temporarily so they are going to be very limited stock and then sometimes they are going to make a very major part of their line, and so we are always trying these different yoyos out and when we really like one that that’s when we put it in the store. Because it is a more expensive process, that makes the yoyos more expensive so we want to make sure that you are really going to love a bi-metal yoyo if you get it from us. 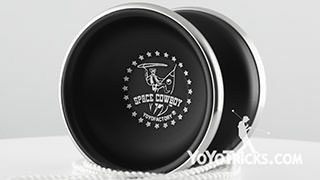 So this one right here is the Space Cowboy and this is one we really do like and on YoYoTricks.com even though this is one of the most expensive yoyo we have on our site we kind of call it the every man yoyo because it’s in some ways it doesn’t have a stand out feature. It’s equally good for all the different skills that a 1a player would have and it’s actually really good for 5a. It actually won, it was used to win, the National Yoyo Contest in 5a in 2014. 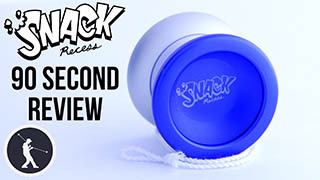 So if you want a yoyo that is going to give you full spread of options as far as learning tricks and maybe even take you into 5a. You just can’t go wrong with the Space Cowboy. So those are our recommendations for 2015, again always just check back in the store in all those different categories and see if we’ve added any new products and we’ll have detailed descriptions and to tell you all about them. 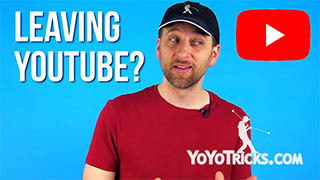 If you have any questions, feel free to log in on Youtube and ask those questions about the yoyos or the tricks and we’re always happy to help you out, and that is the 2015 Yoyo Buyers Guide for YoYoTricks.com.